Gaja and Ryuon got a tie- 7 votes. Hee hee. We have Swan Shiratori f Dekaranger. Hee hee. 2nd place- We have three who got 5 votes, it's a tie. 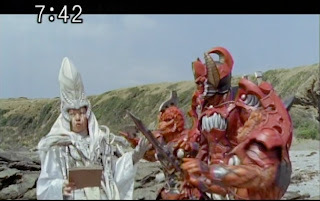 Sentai really had some final one-on-one duels that would have really killed anybody in the real life. These scenes are wehre the injuries are sustained not by just one but two characters in a severe exchange of blows. I think Flashman's duel between Red Flash and Kaura deserves first place. It was really the one that put a lot of injury between the two of them. Looking at all the violence in it, it could have really killed them both in a draw. It's weird how Kaura survived that ordeal though before he died at the end of the episode. The polls are almost closed and as the science rush is about to end, I really find out that most of those who voted have put Swan to a big lead. Now I believe it's time to really write something about this alien from Chinyo on her scientific career. Let's get on to it. 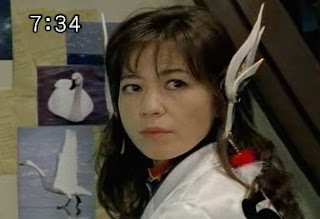 Swan Shiratori herself has been assigned to the Earth branch of the Special Police Dekaranger and she's been the one designing their mecha, modifying their mecha and in charge of the technical side of the base. She apparently had feelings for Doggie Cruger and vice versa, a plot not taken too far probably due to complaints. She was also the first female scientist/commander to have a ranger form although her fighting abilities may pale to Aya Ogadiri of Jetman. After all, it was the 90s sentai that managed not only to pay tribute to Gatchaman but also to "fodder" into other sentai more ideas that kept it fresh (despite the apparent lack of action scenes later). It was also my favorite 90s sentai with its rather fresh start and deeper character relations (Maskman came close though :-P). Ah yes those magnificent Jet Birds. They were created by Skyforce to help defend the Earth from the Vyram and are powered by birdonic energy, probably an alien form of energy. Disgusies are another. Most of those who mastered disguises are the women themselves although the men did participate (but under their instruction) in this kind of warfare. Both heroes and villains have practiced this art but usually perfected by women (men do more rough work than women do). Sun Vulcan was the first to use animal themes namely eagle (red), shark (blue) and panther (yellow) in relation to their attack patterns. Vul Shark was one to be closest to his animal being water. However no animal related mecha was used yet. The Changemen used mythological animals as its motiff although not in its mecha. So far only Change Dragon's animal speaks for itself with his personality. Liveman was the first to use animal based mecha. Somehow the animals didn't only match their styles but also their personalities. For example, Red Falcon like his namesake has slashing skills, Yellow Lion uses lion-like attacks, Blue Dolphin is an expert in aquatics, Green Rhino and Black Bison are expert in ramming attacks. 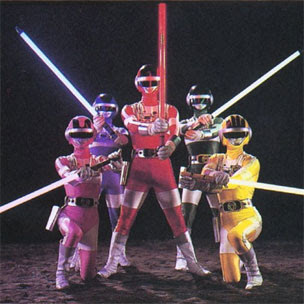 The Biomen used nature related powers via their swords- Red 1 used fire, Green 2 used wind, Blue 3 used shock waves, Yellow 4 used lightning and Pink 5 used laser beams. 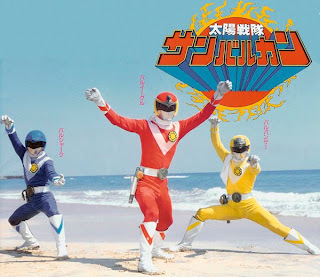 The Dairangers had used different elements- Ryu Ranger uses fire, Shishiranger uses mist, Kirinranger uses time, Tenmaranger uses gravity and Hououranger uses wind. The newcomer Kibaranger uses sound. The Kakurangers being ninjas used nature-related powers. Ninja Red uses fire, Ninja White uses wind, Ninja Blue uses water, Ninja Yellow uses lightning and Ninja Black uses earth. Ginga Red used fire, Ginga Green used wind, Ginga Blue used water, Ginga Yellow used lightning and Ginga Pink used well, plants. However these powers were inherent within them before they even donned their Ginga suits. Cheesy huh? 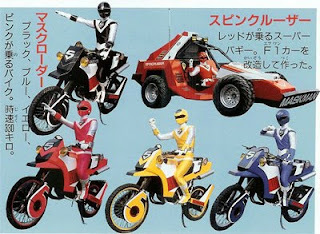 Super Sentai had some of its karts which were for the red rangers. I think some of them did hold a specific purpose, others just built for that way. Either way I'd like to talk about them. Maskman's Spin Cruiser was developed for a good reason- to save a boy and his father trapped in a vortex warp created by Capilla Dobler. It was the only arsenal they had that could save them. 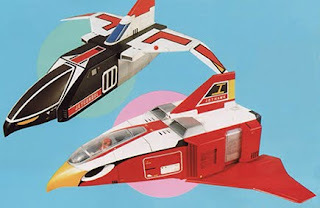 Turboranger's Turbo Attacker was simply an alternate vehicle in Turboranger for Red Turbo, a concept later ported into Carranger. It didn't have much of a storyline though. It was imfamously used against Racer Bouma in a rather epic duel. 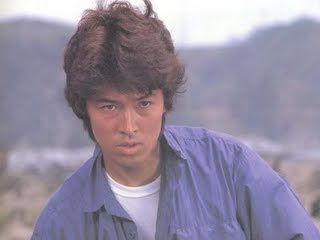 The last but not the least, the Jet Striker in Jetman. Its true nature wasn't revealed until Kaori Rokumekan, Ako Hayasaka and Raita Ooshi were trapped by Camera Jigen and its alternate mode as the Fire Bazooka was the only one that could save them. Towards the end of the series, Radiguet destroyed it overpowering the Fire Bazooka's blast.